Niagara-On-The Lake has been home to wine, dining and many great culinary talents over the last several decades. Most of which have made a home here at Niagara College. Opening a new chapter at Benchmark Restaurant, we welcome our newest addition Chef Manager Alex White, whom just moved here from Toronto with his wife. Working in downtown Toronto is the dream of most cooks growing up in the suburbs. Born and raised in Mississauga, Ontario, Alex shared that dream of working in one of the fine dining establishments of the busy and growing city. Starting as a dishwasher at the age of 15 in a local fish and chip shop, Alex was drawn to the industry and took off to the Culinary Program at Humber College. 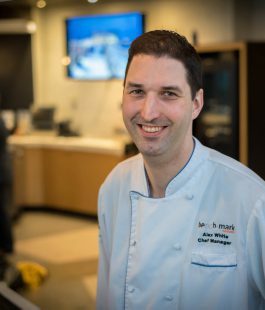 He worked his way up several Mississauga kitchens learning under Chef Luther Miller at Delta Meadowvale Resort & Conference Center, and Chef Olaf Mertens at On The Curve Hot Stove & Wine Bar and opening brand new, Bistro Narra, before finally moving to the big city. It was downtown that Alex found his true passion for food. Working at Marben Restaurant with long time friend Misha Nesterenko and Top Chef Season 2 Winner, Carl Heinrich, all meat and produce was ordered whole and processed entirely in house. Making connections with farmers outside of the city and serving the freshest ingredients in inventive ways translated into a new category of cuisine. “Ingredient Inspired & Locally Driven” became the nose-to-tail / farm-to-table passion that Alex has. The Niagara Region known for Fruit farms, Grape Vines and Wine became a huge draw. Implanting himself into the culture became a personal passion and goal. Bringing a new take on the local vision, using great fresh product, and working with an already great and impressive team at Niagara College and the Canadian Food and Wine Institute, Chef Alex White is excited to be a part of the NC family.